Learn more about our Optimized Timeslot Data in our Knowledge Base article, "How are Recommended Timeslots created?" Go to the Your Schedule page (located in the pop-out menu in the left hand navigation). 2. 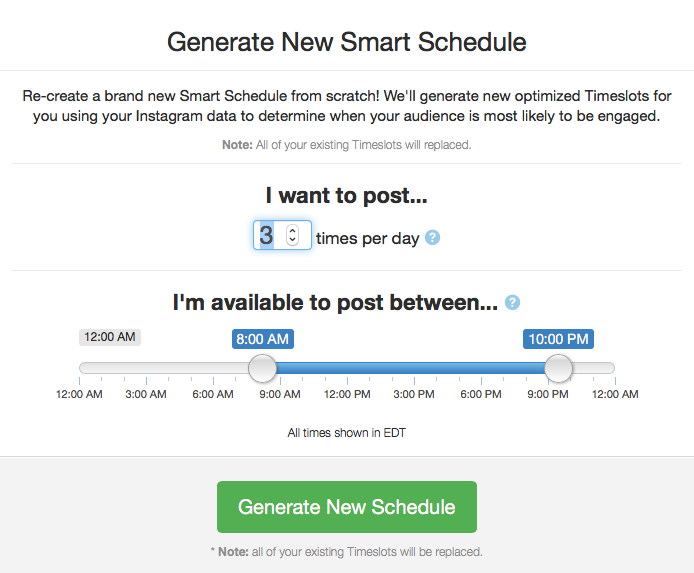 Just to the Right side of the page, find the "Generate New Smart Schedule" button. You'll then get the option to choose how many timeslots per day as well as the in-between hours to post during! For Pinterest users who are using our SmartLoop tool, you can generate a new Smart Schedule by clicking the Recreate Schedule on the left side of the page next to General Queue. • All of your existing Timeslots will be replaced. • Currently scheduled posts in your calendar will NOT be changed or affected. 3. 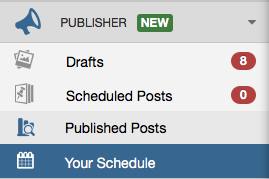 Enter the amount of timeslots you want per day, when you are available to post, and click, "Generate New Schedule." 4. Ta-da! A new schedule has been created for you, easy as that. If you'd like help re-arranging your currently scheduled pins that were not changed with the new timeslots, check out our Knowledge Base Article, "I removed timeslots, but I still have extra Posts scheduled?"